Drawing on his remote, off-the-grid upbringing on the North Shore of Maui, Charles Marley Rutkowski has used his many diverse opportunities to fuel his interests in science and engineering, and to establish a firm and broad STEM knowledgebase. 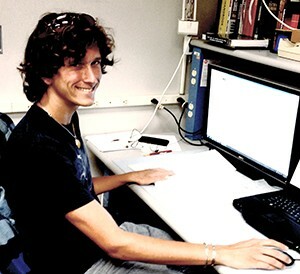 After attending King Kekaulike High School, Marley recently completed his bachelor’s degree in Electrical Engineering from the University of Portland, including minors in Computer Science and Physics and a study-abroad in Ireland. While taking advantage of the joys of life, Marley plans to continue expanding his knowledge, all the while applying it to invigorate his community and the lives of those he encounters. Project Abstract: The FMOS instrument used on the Subaru telescope is a fiber multi-object infrared spectrograph with two separate modules that each utilize 200 fibers and are capable of observing 50 objects in parallel. The sensors of each module must be cooled to around –60?C, however the cooling system of the second infrared spectrograph module (IRS2), designed by a collaborating university, often malfunctions. Since its installment, the system, which is centered on programmable logic controller (PLC), has not been well understood and has not had effective integrated debugging. Therefore, when problems arose, it was very difficult for Subaru technicians to diagnose them. In order to reduce instrument downtime in such a case, the system needed to be reverse engineered, documented, and retrofitted with an intelligent error-notification system, so that technicians can quickly diagnose and service faults. Understanding the system required analyzing the PLC ladder logic code, the physical “black box” wiring and component setup at the summit, and the minimal amount of available documentation. By combining and cross-referencing these resources, an understanding of the key functionality of the system was gained and documented for future reference, providing explanations for previously bewildering system behavior. Additionally, using this knowledge and working with Subaru’s FMOS scientist, system-monitoring improvement and remote-control modifications for the climate control PLC code have been devised and implemented. Although great advancements have been made in understanding and documenting the IRS2 system, in order to fully understand it, future exploration is required, including a temporarily deconstruction of the module.